There are few things more satisfying than seeing a creative work come to fruition under my hands. It isn't always the finest work of art, but I have poured something of myself into that thing and it exists because I thought of it and shaped it. That's a sweet feeling. That handcrafted joy is kicked up a notch even when I see the work of another person's hands because there is the added delight of mystery and wonder. It reminds me that I am not you and that you have a unique genius given by our Lord that I can't ever fully understand, see, or embrace. That handcrafted pretty you just made for me? That's a tiny glimpse. I am in awe of your Maker and His handiwork. And if you sell what you make, I'll probably want to buy one of everything that you have! Or two. I was recently introduced to to Christine from Ashcraft Creations and BOOM! that feeling hit me hard. 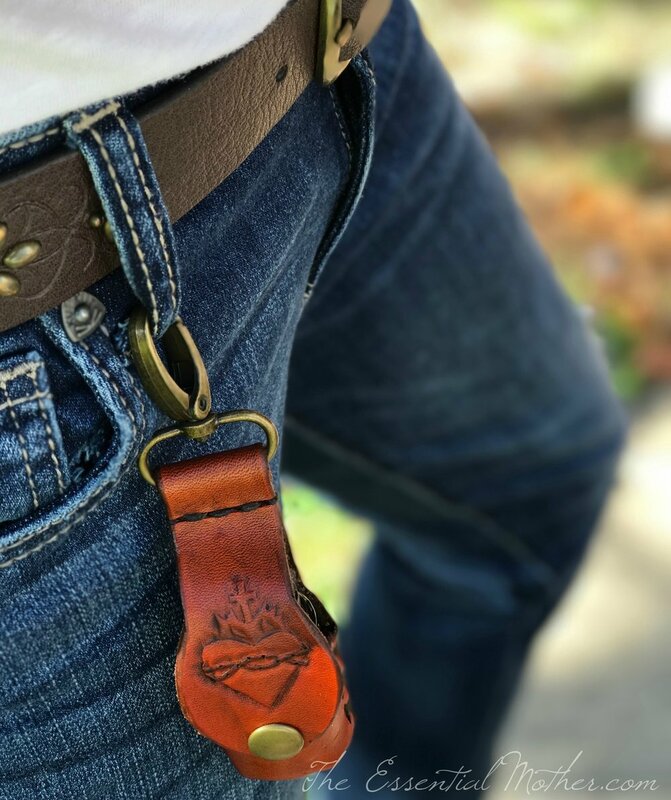 I saw one of her leatherwork pieces on Instagram and immediately clicked over to her Etsy shop. One of everything, please! 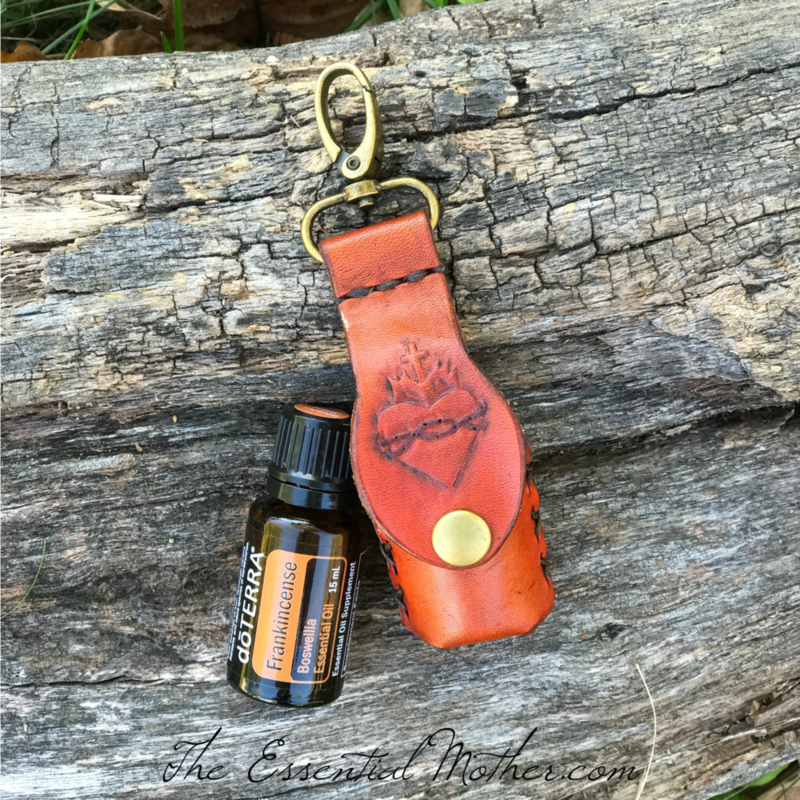 Can you make an essential oil holder keychain? With the Sacred Heart imprinted on it? She said yes and my amazing oil keychain arrived on my doorstep a short time later. It holds a 15 ml bottle and I love it. It's just a "thing" but is also the unique creative impression onto my life of a sister in Christ. Plus it's just really cool and it holds essential oils which are such an important part of my life. I see what you did there, God. That was so cool. Thank you. So today, I thank God for the gift of Christine at Ashcroft Creative and for her willingness to share her talent with the world. Please visit her shop and use this 15% off code (ends Friday, October 27th) to pick up a few early Christmas presents. You still have time to place a custom order! For more information on how to purchase and use therapeutic grade essential oils, go HERE. I have been so blessed by having plant-based medicine in my life!